The suggestion that every member of the public simply accepts what is presented to them through institutions as authentic would seem unjust. To accept all presentations as fact seems almost ridiculous but how often do we actually question the authenticity of information produced from institutions such as museums and sites associated with the production of knowledge? Fusco in collaboration with Gomez-Pena worked on ideas of site specific performances that would touch on issues of colonisation and the exploitation of the indigenous peoples upon their arrival in Europe and America; this would, in turn ridicule the fact that the only reason they were being invited to show their work, was because it was the official year of multiculturalism. The result of this investigation was a performance that consisted of Fusco and Gomez-Pena dressed as two members of a fictitious tribe, loosely based on the characters from an American soap opera from the 1960’s called Gilligan’s Island. 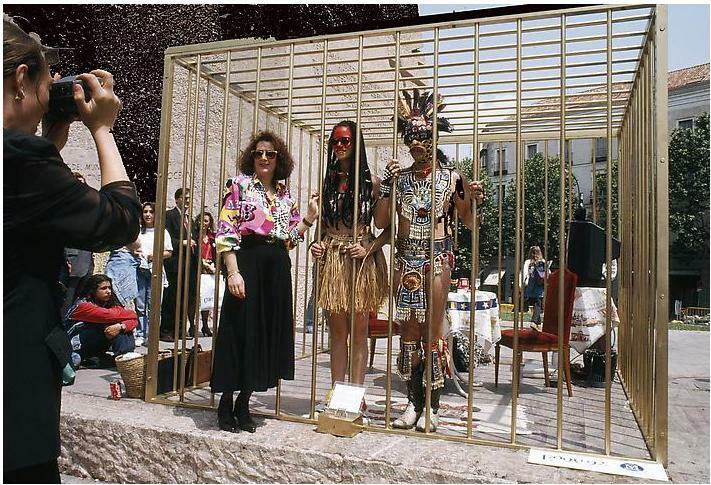 Displayed in a golden cage, dressed in all manner of paraphernalia, they would interact with the public using a series of fake customs and a few words of a language that appeared ‘traditionally native’. The fact that any member of the audience watching this performance could go without questioning its authenticity only further cements the power of the museum as an institution for education. It would appear that anything, however ridiculous, when placed within, or around the vicinity of a site of the production of knowledge, can be and often is, willingly accepted as truth. Rather amusingly, Fusco goes on to comment that the performance “generated all kinds of controversy and tense dealings with cultural bureaucracies, because some people were really angry that we were not telling the truth.”4 Exposed in the work of Coco Fusco and Gomez-Pena is the idea that the mere association with a museum or museum practices is enough to render its content authentic.